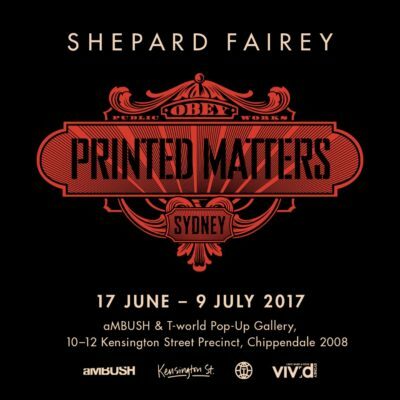 aMBUSH Gallery, T-world and Vivid Sydney present Printed Matters Sydney, a solo exhibition by Shepard Fairey. Printed Matters is an ongoing series of exhibitions, focusing on the importance of printed material in Fairey’s art. Each exhibition highlights the significance by incorporating a variety of Fairey’s printed material, including serigraphs on paper, editions on wood, editions on metal, and fine art collage. New works are added for each venue, making each Printed Matters exhibition a unique experience. Beginning in 2010, the Printed Matters platform was first presented in Los Angeles, and for its next installment will exhibit in Sydney at a pop-up gallery in Chippendale, on view from Saturday, June 17 – Sunday, July 9. Fairey is known around the world for his iconic imagery; whether it’s the Barack Obama HOPE poster, his evolving sticker campaign, or his brand OBEY. He will be appearing as a keynote Game-Changer speaker for Vivid Ideas, as well as painting his largest mural ever, located at 309 George Street. In addition, he currently has a free public exhibition at the Darling Quarter precinct entitled Revolutions. In addition to the exhibition, T-world is releasing two exclusive T-shirts to commemorate the show and Fairey’s tour as an official OBEY x T-world collaboration. The limited-edition T-shirts are exclusive to the event and only available at the pop-up gallery, reflecting the ethos of T-world’s “Print is Premium” stance.